In the 1980s, histology of a poorly differentiated carcinoma showing an aggressive behavior was proposed by Sakamoto et al. and other pathologists. This was adopted as an independent entity by the World Health Organization (WHO) and in the General Rules for the Description of Thyroid Cancer by The Japanese Society of Thyroid Surgery (JSTS). Furthermore, the Turin classification was recently proposed as the newest classification system for poorly differentiated carcinoma. Furthermore, although tall cell variant is not included in poorly differentiated carcinoma, it is thought to show aggressive characteristics. 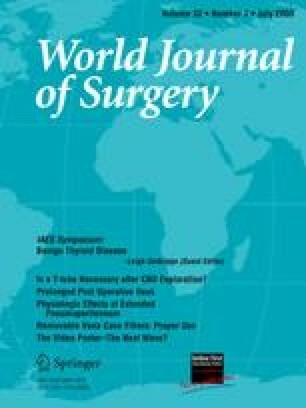 In this study, we investigated the prevalence and clinical significance of three types of poorly differentiated carcinoma defined by the WHO classification system (poorly differentiated carcinoma [WHO]), Turin proposal (poorly differentiated carcinoma [Turin]), and JSTS (poorly differentiated carcinoma [Sakamoto]), and tall cell variant in papillary carcinoma. We investigated the prevalence and prognostic significance of these three histological types in 1707 papillary carcinomas. In our series, 189 (11.1%), 15 (0.8%), 5 (0.3%), and 62 (3.6%) patients were diagnosed as having poorly differentiated carcinoma (Sakamoto), poorly differentiated carcinoma (WHO), poorly differentiated carcinoma (Turin), and tall cell variant, respectively. Poorly differentiated carcinoma (WHO) and tall cell variant independently affected cause-specific survival (CSS) of patients, but poorly differentiated carcinoma (Sakamoto) predicted only worse disease-free survival (DFS) of patients on multivariate analysis. Poorly differentiated carcinoma (Turin) showed the worst DFS and CSS rates of patients but was not confirmed as an independent prognostic factor probably because of the small number of patients. Poorly differentiated carcinoma (WHO) and tall cell variant significantly affected patient prognosis. Poorly differentiated carcinoma (Turin) accounts only for 0.3% but showed the worst survival rates. Although poorly differentiated carcinoma (Sakamoto) predicted the likelihood of carcinoma recurrence, it is more appropriate to define this lesion as one of the histological subtypes of papillary carcinoma rather than as an independent histological entity.